This was honestly the best looking day I chased on my chase cation. Good instability, good shear, but maybe almost too much shear. Dewpoints in Eastern New Mexico were pretty good in the 60’s and it looked like super cells were likely. Having stayed in Lubbock the night before, we woke up pretty close to our target for the day. A short drive to David Drummond’s house where we picked a final forecast, before heading out to check out his horses. Sarah went for a short ride and we fed his horses and had a pretty good time before deciding to hit the road to chase. Down southwest to Seminole for a quick stop for lunch before heading west towards New Mexico and Hobbs. A quick stop at the state line sign, which was quite elaborate, and again at the Hobbs, NM sign. The 4 of us were all in the same vehicle, and we went to find a place to park for awhile south of town. Storms literally blew up right to our west and southwest approximately 15 minutes after we arrived at our target. Almost perfect targeting! The updraft was pretty magnificent, and quite photogenic. Unfortunately 18mm wasn’t wide enough to capture everything as it pretty much blew up over our heads. The whole thing was rotating and was very pretty. It was the first real super cells Jari and Sarah had both seen with this kind of motion. 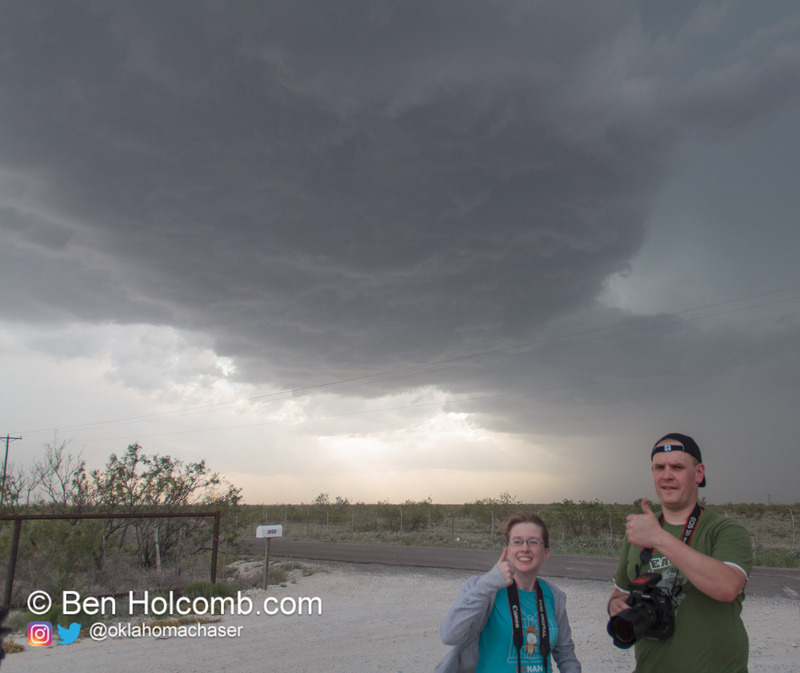 We eventually ended up back north on the west side of Hobbs near an interesting part of the storm. It appeared that outflow from the storm to the north was somehow interacting with the current storm. There was a definite wall cloud and some insane motion, but alas it seems like the cold outflow prohibited any sort of tornado development. It was extremely hard to give up on this storm, but we eventually had to and headed south again to try and keep up with the storm. There was two storms, and we were sandwiched between them as we got down to near Jal. Both looked like they had potential, and we ended up sticking to the west storm. Unfortunately nothing happened with that one, but the TIV crew did report a tornado with the one to the east near Andrews, TX. We continued down to the town of Goldsmith just north of Odessa where we setup under an overhang for the storm to blow in. It shielded us from most of the hail, and the oil rig burn off of natural gas blew up huge in the winds from the storms which illuminated everything while the storm blew in. As the storms blew threw, we decided to head further east. We found some power lines downed, but there wasn’t any way we were going to get back in front of the storms which had started forming into a bow-echo. All in all a great chase, but it could have been much better. The nearly east surface winds and westerly/zonal flow aloft seemed to be almost too much turning in the atmosphere and the snaking boundary didn’t seem to be enough to get things done.